Marble House was built to impress. Mr. and Mrs. William K. Vanderbilt were “new money,” their fortune had been made by William's grandfather Cornelius Vanderbilt, the railroad tycoon, earlier in the century. As such, they were not entirely accepted by the top tier of the social elite. Using their vast wealth, Mrs. Vanderbilt, the former Alva Erskine Smith, meant to change that through extravagant entertainment and opulent building projects. Inasmuch as in 1880s the social elite spent the summer season at Newport, Alva had to have a Newport cottage. For this project, she choose a location on Bellevue Avenue next to the mansion of Caroline Astor, who was then the reigning monarch of New York society. Alva's cottage, however, had to be much grander than neighboring Beechwood. To this end, fashionable architect Richard Morris Hunt was given free reign and unlimited resources. The result was a neoclassical design inspired by the Petit Trianon at the Palace of Versailles. 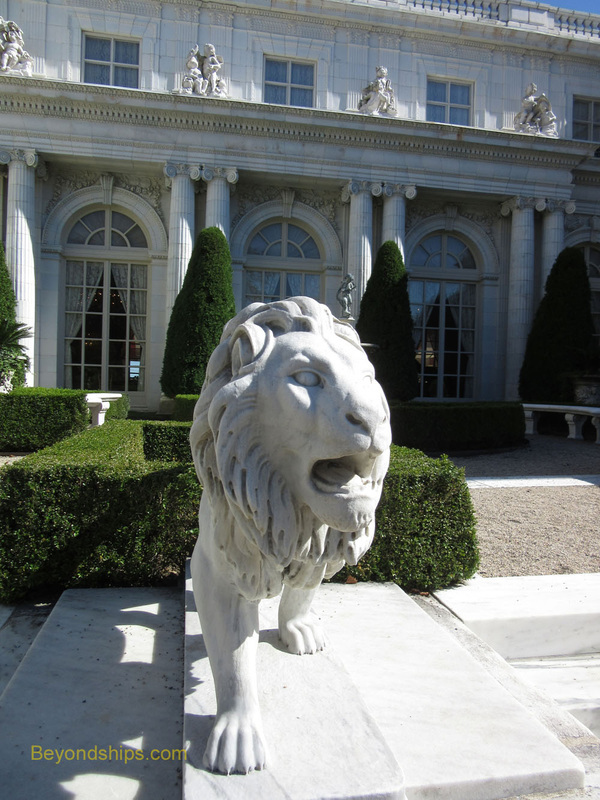 It is called the Marble House because it is built of some 500,00 cubic feet of white marble. Inside, many of the towering rooms are built of colored marble. It is decorated in the style of the French kings, Louis XIV and Louis XV. Sculpture, paintings, antiques and furniture created especially for the house make up its contents. Upon completion, Alva was given legal title to Marble House and it is very much her house. (William only spent two summers there). She used the house as a venue for extravagant parties, setting a new standard for Newport. These helped move her towards the pinnacle of Newport society. Although in later life Alva gave admirable support to the cause of woman's suffrage, she was essentially self-centered and not a very sympathetic person. Haughty and determined, her obsession with climbing to the top of the social ladder even extended to bartering away her daughter. In those days, the highest rung on the ladder was the British nobility. However, the fortunes of many of these aristocratic families had run low. Consequently, heirs to many of the great titles came to America to obtain an infusion of cash by marrying the daughters of the new American millionaires. In 1895, Alva arranged for the Duke of Marlborough to marry her daughter Consuelo. The Duke did not love Consuelo, he was there for the money. Consuelo loved another man but dutifully acceded to her mother's desire to have a duchess for a daughter. Unhappy and loveless, this marriage dragged on for 38 years and finally ended in an annulment. This flaw in Alva's character is reflected in Marble House. Individually, each of the contents is a treasure. However, placed together they are too much. They were not brought together for beauty or to enhance the lives of the people who lived in the house. Rather, they were brought together to awe visitors. As a result, the Marble House does not feel like a home. It is cold and impersonal. Furthermore, at the end of the day, Alva failed to achieve her objective with Marble House. Such an assembly of treasures is not in very good taste and is a hallmark of the nouveau riche. The “old money” and foreign aristocrats who were the primary targets of her efforts would not have been favorably impressed. This does not mean that the Marble House is not a “must-see” among the Newport cottages. It played too great a role in the story of the Gilded Age. In addition, it is a classic mansion and its contents are worth seeing, although it can be like eating too much birthday cake. The Chinese Tea House in back of Marble House. A short distance down Bellevue Avenue from the Marble House is Rosecliff. Not designed to impress and awe, Rosecliff nonetheless charms the visitor with its light and airy atmosphere and visual appeal. 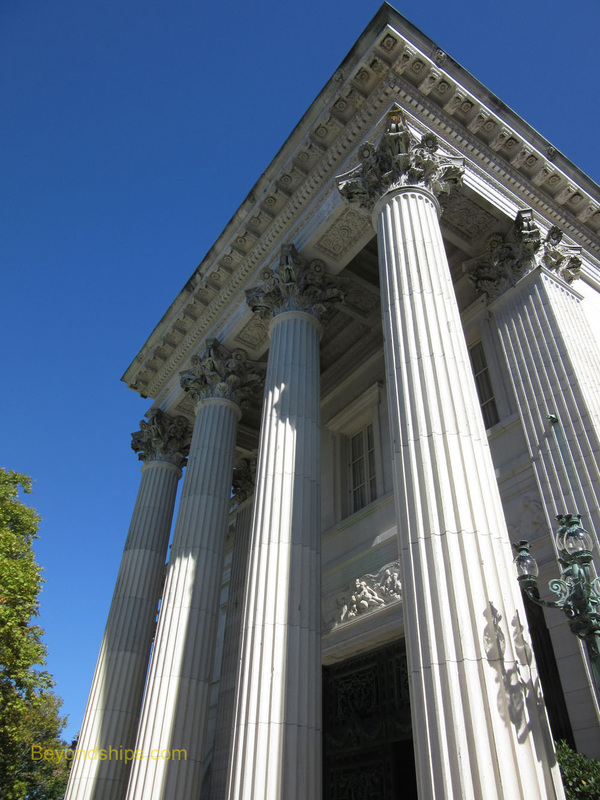 Rosecliff was designed by Sanford White of the prestigious architectural firm McKim Mead and White. Like Hunt's design at the Marble House, White was inspired by the Palace of Versailles but by Louis XIV's garden house, the Grand Trianon rather than the Petit Trianon. White reduced the French design to its core, creating an H-shaped structure. For its exterior, he used white architectural terracotta tiles that give the appearance of marble. However, using a series of giant arched French doors, he successfully avoided giving the structure a heavy look. A similar graceful restraint has been used in the interior. This includes the curved stairway by the main entrance and the light-filled double height rooms on the ground floor. A ballroom on the ground floor connects the two wings of the building. At 80 by 40 feet, it is the largest ballroom in Newport. You may have seen it in the movies including The Great Gatsby, True Lies and Amistad. Upstairs, there are a series of bedrooms. These were designed to be comfortable rather than impressive. This is in keeping with the fact that Rosecliff's primary function was to act as an entertainment venue. 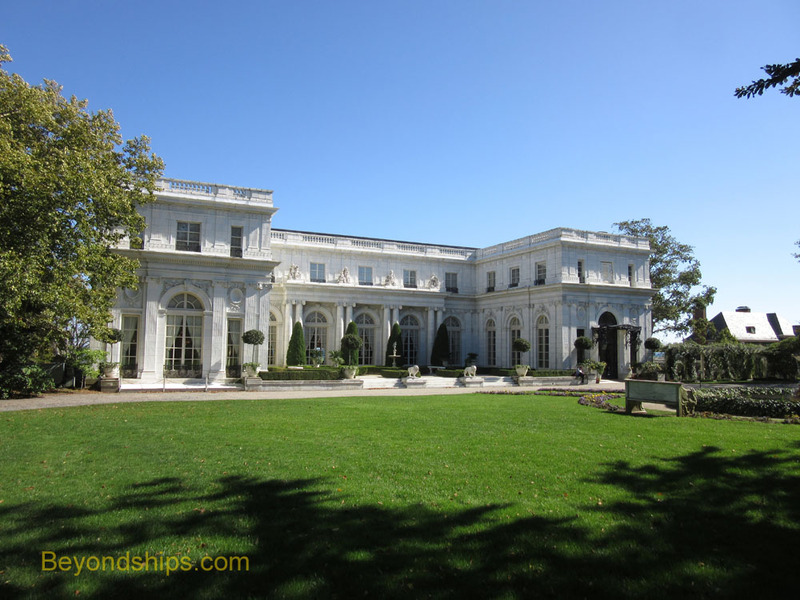 Rosecliff was built for another of Newport's great hostesses, Theresa Fair Oelrichs. Her father James Graham Fair had struck it rich mining silver in the Comstock Lode in Nevada. His wealth enabled his daughters to marry into New York Society. Theresa married Hermann Oelrichs while her sister Virginia married William K. Vanderbilt II, the son of Alva Vanderbilt. Despite this family connection, Theresa competed with Alva (who by this time had divorced and married Oliver Hazard Perry Belmont) and Mrs. Stuyvesant Fish of Crossways to stage the most lavish balls and parties. Indeed, Theresa moved into Rosecliff in 1900 before it was completed so that she could have a party for over 100 guests to outshine Mrs. Fish's Harvest Ball. Theresa's most spectacular party was the Bal Blanc in August 1904. The house was decorated in white flowers and all of the women guests were instructed to wear white and powder their hair. In the waters off Rosecliff, she moored a dozen white artificial sailing ships. After Theresa's death in 1926, Rosecliff passed through a series of owners and was largely left to deteriorate. Alan Van Clief had the house restored but was tragically killed in an auto accident on his way to see the completed restoration.